The box stitch, or corner-to-corner stitch, is for more than just afghans! 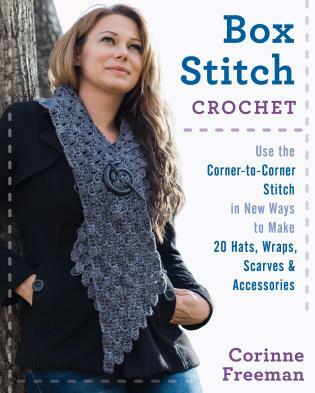 Crochet it in creative ways to make wraps, scarves, hats, tops, fingerless mittens, and other accessories with the instructions and patterns in Box Stitch Crochet. Learn the basics of box stitch with step-by-step instructions, and then learn to work it in a rectangle, with a beveled edge, and as a motif. Learning to change colors within the stitch and join pieces will enable you to crochet pieces you wouldn't have thought were possible with box stitch. By creatively manipulating this classic stitch, Corinne Freeman has designed a wide range of easy, fun, and fashionable crochet designs. The stitch is quick to learn, and once you know it, you will be ready to complete the Butterfly Shawl, Crossing Neck Scarf, Under-the-Sea Motif Shawl, and any other design you choose. Corinne Freeman is a crochet designer who believes that the box stitch should be set free from its "box" as an afghan stitch. She has a presence online through Crochet4myButterfly.com, Etsy, and Elann.com. She lives in Calgary, Alberta, Canada.